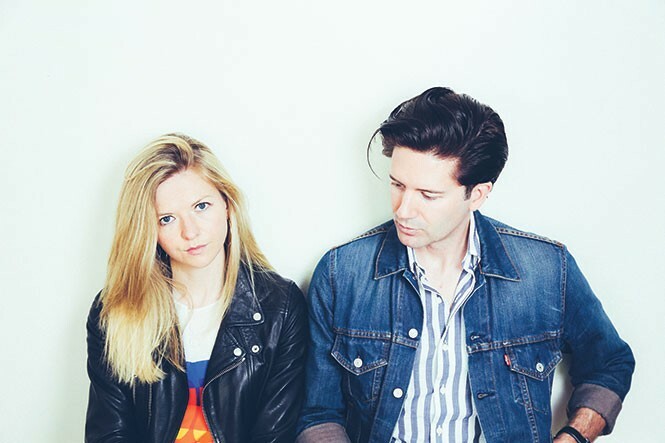 Still Corners takes a deep dive with Dead Blue. The origins of the London-based duo Still Corners are as enigmatic and wayward as the psychedelic dream-pop they've been cultivating since 2007. When Austin native Greg Hughes finished school at the University of Texas, he decided to expatriate to England. "I was looking to go somewhere, and I had met an English girl and followed her out there," says Hughes, who's pulled over to speak with City Weekly from the roadside en route to the band's next show in El Paso. "It didn't work out, but I had built up a life there. I was just looking for a partner in crime, really." One evening, Hughes found himself on a train traveling from Charing Cross to London Bridge. The train didn't stop until he arrived on a lonely platform in Southeast London. There, he met Tessa Murray, a London native who happened to be on her way to meet with a choir group that had invited her to join. "It was quite dark, and not a very nice part of town, and we just got talking about music and books because it was a while before the next train," Murray says. "It was really just a happy coincidence." Since that serendipitous meeting, Murray and Hughes have collaborated on three albums together, beginning with 2008's self-released EP Remember Pepper. It's a spooky little package, setting Murray's ethereal voice loose to drift back and forth within a new-wave graveyard of giallo-inspired synth solos and psychedelic guitar riffs. Still Corners soon signed with Sub Pop, where they released Creatures of an Hour (2011) and Strange Pleasures (2013). Creatures clings to Pepper's nostalgic underpinnings, but songs like "Endless Summer" and "The Twilight Hour" show a stripped-down, minimalistic side that pairs Murray's vocals with arrangements that are more acoustic than electronic. Pleasures marked the band's transition into a more futuristic sound, blending elements of synth-pop with melancholy guitar chords that echo through space like the final transmissions of a dying satellite. Their newest album, Dead Blue, marks not only a new direction in the band's aesthetic, but in their professional lives as well. After Pleasures, the band parted ways with Sub Pop, and started their own record label called Wrecking Light. "We thought, 'Why don't we try this ourselves instead of renegotiating?' We talked about it with our managers, and it seemed like a good time to try and experiment with something new." As part of their journey into unfamiliar territory, the band recorded Dead Blue in Deal, a small town in Kent, on the English coast. "We went to check it out, and totally fell in love with the place. It's really slow and everyone's very friendly," Murray says. "We went ahead and rented this house that was right on the beach and started working on the album there. It ended up being really inspirational to the music—every day we'd look out the window and see something different." While the band's previous albums flirted with expansive sonic landscapes, Dead Blue has embraced its oceanic inspiration, creating a more sprawling narrative. "I think this record leans to a darker sound, and it came out of living by the ocean—I guess that's where we got the title for the album," Hughes says. They also wanted to experiment with "more sounds" and "more space ... between instruments. I think we were going for that less put-forward sound." When Still Corners hits Salt Lake City, they'll only have a few shows of their North American tour under their belts. But Murray promises, "By the time we get to Salt Lake, we'll be a well-oiled machine." Attendees can expect an audio/visual spectacle that matches surreal visuals with the band's breathtaking soundscapes. "We like to create an atmosphere and take you out of the present moment into a more dreamy kind of thing," Hughes says.